Greatness isn’t something you’re born into, rather it is something you earn and if you’d like to earn the type of greatness that is held by Ron Swanson, there’s more than a few rules and ideologies you’re going to have to commit to, all outlined in Ron Swanson’s Pyramid of Greatness. The rules include things like avoiding skim milk, having firm/dry 3 second handshakes and not emotionally sweating. 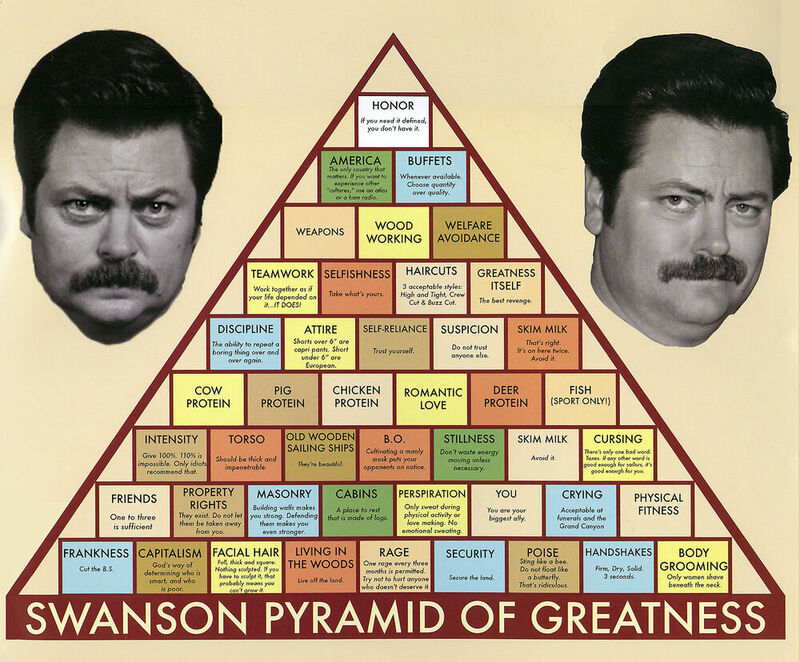 You could hang the Swanson Pyramid of Greatness in your bedroom as an early morning reminder as to the proper way to live your life or maybe in your office so people will stop questioning your full and squared mustache. You could even get the Swanson Pyramid of Greatness in t-shirt form; all followers once devout should go on to preach the word and what a better way to do so than wearing it on your body.